We as monkey caregivers must live everyday with the knowledge that safety is the most important thing to be aware of with our monkeys. 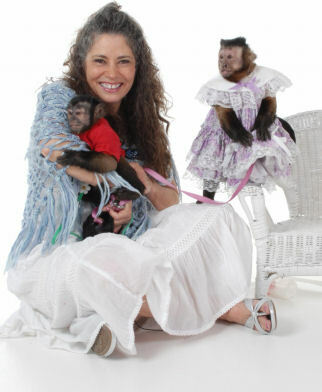 In choosing to follow Safety First monkey care-giving, when you are away from your home with your monkey, you will be able to relax and enjoy your time with your friends and family. I have found that peace of mind when it comes to monkeys is something that I must have at all times. So, it is very important for me to make plans ahead of time in order to know what I would do in case of a real emergency; such as a monkey is stolen, or one escapes, or even an accident, such as a bite or scratch happens involving another person. A motto that I live by is to always choose to think about Safety First when planning the events or outings that I will be attending. These are just a few of the questions that I will ask myself before I say yes to taking the monkeys out: Is this okay to do with my monkeys? Will their safety be in prosody? Will anyone else be put in danger with what I am planning to do with my monkey? Will the temperatures be acceptable? Will there be pets that are not tethered? The following information will always be here on this site for you and your loved ones to access if one of the above listed events takes place with your monkey. These are suggestions, of course, but I do know they have been tried and tested many times with a lot of people that have had to respond quickly to monkey emergencies.